This command xcopy using the MS-DOS command prompt can be used for retrieving files from a source storage or a folder of a drive like the My Documents folder. Using the xcopy you can transfer the files from My Documents folder to the external drive like the USB flash drive. This is useful whenever if the windows have damage or damage by a virus. You can safely transfer the files using this command. To start of this command follow the procedure below. See also the image above attached here. To start click start button, if winxp click run, if win7, 8, and 10 click search button. Type cmd then press enter key. 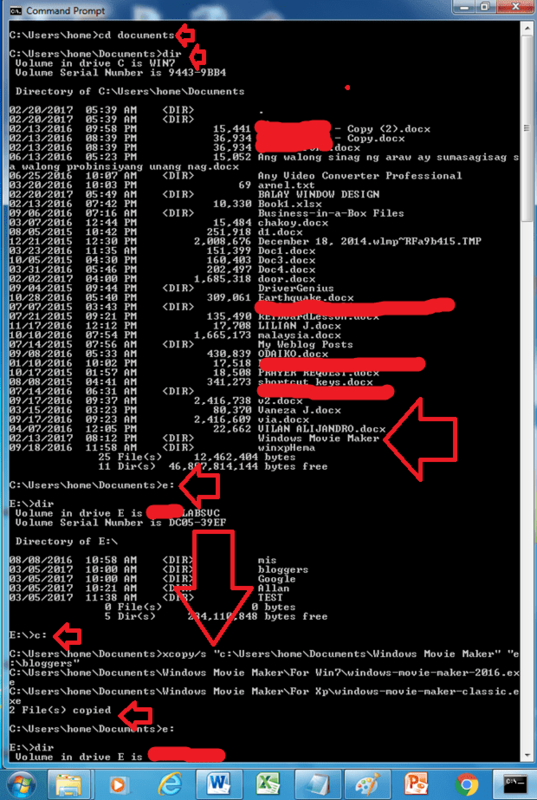 In your command line, find the My documents folder or directory, example c:\User\Home>dir then press enter key. If you find the folder of documents or files, insert your USB flash drive and create a folder or directory in this drive. Use the command to change drive, ex. c:\User\Home\Documents>e: then press enter key. Once you're in your USB flash drive, create a folder by using the command MKdir then name of the directory you want, example: e:\>Mkdir backup then press enter key. 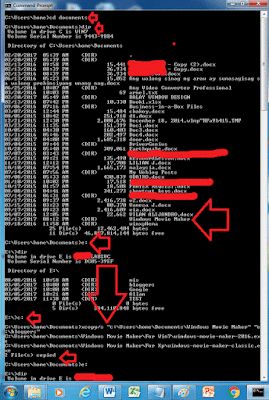 Use DIR command to check whether the directory or folder you created is exist now. If the command line is like this: c:\User\Home\Documents> you're ready now for xcopy, follow the example how I created the command: c:\User\Home\Documents>xcopy/s "c:\Users\Home\documents\Windows Movie Maker" "e:\bloggers" then press enter key. The computer now will start to copying the files from the source folder to your target drive folder. When copying is finished, you can check now your transferred files, you can use this command: e:\>dir then press enter key. Then to check your files inside in this folder, use the command dir, or like this e:\bloggers>dir then press enter key. Of all the instructions above, you can use the other partitions on your drive like the drive d: which is the backup drive of your computer. But make it sure that you will create a folder or a directory of your files. If you have questions type it in the comment bar below.